Ann Gerhart of the Washington Post drew a different conclusion from me (see "Inappropriate Touching") about Mitt Romney touching Rick Perry during the last GOP debate. I said it was a winner for Romney because it made Perry look like the child and Romney like the grownup. A classic stupid power play that worked. Although I empathized with Perry's seeming fury at the gesture, that fury only made him look like more of a child. "During one of their debates in a New York Senate race in 2000, Rick Lazio marched over to Hillary Rodham Clinton to confront her about a pledge she’d made. She ignored him. Now she’s in Kabul, and Lazio is a line in this story. "John Neffinger sighs. 'You know, Gore tried that in every practice debate,' says Neffinger, a Democratic consultant who specializes in image, 'and all his coaches said don’t do that, and he goes out there and does it anyway.'" I don't remember the Gore walk-up at all, so I couldn't tell you who I thought the winner of that body-language maneuver was. I do remember the Lazio maneuver, and it's true, he looked stupid. In neither case, however, was there actual touching. 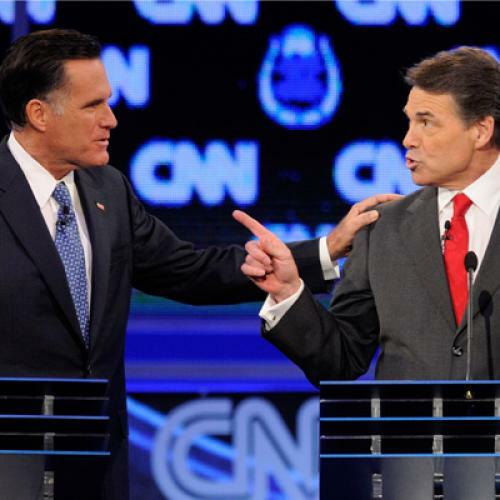 In other touching news, it has come to my attention that Rick Perry deployed the finger jab this past summer. The finger jab is more blatantly hostile and therefore not a good technique. Condescension is OK, but outright anger is not, and no not-angry person ever jabbed anybody in the chest. Advantage: Romney. And he wasn't even there!